Oliver Letwin has told the Conservative conference Labour has given taxpayers poor value for money - but stopped short of promising tax cuts. The shadow chancellor has eight "unfair stealth taxes" in his sights, including council and inheritance tax. But he said he would not make pledges now because too many politicians had broken their word on tax in the past. Earlier co-chairman Liam Fox said the "revitalised" Tories must end Labour's "intruder state". Dr Fox sought to rally Tory activists after the party was pushed into fourth place in the Hartlepool by-election by the UK Independence party. He said they had to "reclaim" the red, white and blue of the Union Jack from the far right. Dr Fox branded Tony Blair, who said last week he would step down at the end of a third term as prime minister, a "lame duck prime minister". He kicked off the conference under the slogan "timetable for action" detailing what the Tories would do in the first months of government. Conservative policy co-ordinator David Cameron said the party had to be very precise about its plans. "If anybody says I will promise you a transport system for the 21st century, they will be taken out and shot," Mr Cameron told the Guardian, as an example of the sort of slogan he thought too vague. In his keynote conference speech, Mr Letwin complained that some pensioners were paying a third of their disposable income on council tax and that in some parts of the country someone expecting to inherit an ex-council home had to pay death duties. "What really makes it desperately unfair is that all these people are not even getting value for money, " he said. He pointed to lack of school choice and hospital super bugs. Mr Letwin continued: "Can we take action to change things? You bet we can. We can thin down this fat government by getting the money from the taxpayer to the front line, where is it needed." He dismissed suggestions it would be courageous to promise now to cut taxes. "Nobody out there would believe us at all because there have been too many broken promises on tax from too many politicians," he said. 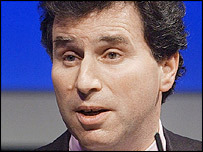 Mr Letwin said: "On the first day of the next Conservative Government I will freeze civil service recruitment. "In the first week of that government I will lift the controls, those wretched best value performance assessment regimes, off local government. "And in the first month of that Conservative government, I will deliver a Budget which will implement the James reforms, begin the thinning down of those fat bureaucracies and set Britain on the path to a lower tax economy." Mr Letwin dismissed Gordon Brown's civil service cuts as a "sham" and argued the Tories could at the very least stave off Labour third term tax rises by cutting bureaucracy. Earlier, Mr Letwin told BBC Radio 4's Today he would be able to outline precise tax cut plans "when we know what the economic inheritance is". He said a Tory election win was "entirely possible" because people were so disillusioned by Labour. Labour Chief Secretary to the Treasury Paul Boateng said the Tory figures did not add up. "Far from guaranteeing to cut taxes, the only cut that's guaranteed from the Conservatives is an immediate and massive cut in public spending on schools, hospitals, transport, the police, and other vital public services," he said. Liberal Democrat spokesman Vince Cable said his party had offered hard policies on simplifying taxes. "All we have had [from the Tories] is vague aspirations," he told BBC News 24. A poll in Monday's Times newspaper suggests the Tories are less popular than they were at the time of last year's conference under Iain Duncan Smith. Mr Duncan Smith was ousted less than three weeks after a conference dominated by speculation about his leadership. The party was sitting at about 30 to 33% in polls. They are now on 28%, according to the Populus poll in Monday's Times, with Labour on 35%, the Lib Dems on 25% and UKIP on 5%.